WIT has recently launched two bursaries for students who intend to travel to New Zealand as part of their work placement module. This is the first year of the Agricultural Science Association (ASA)/Glanbia travel bursary for BSc in Agriculture students and the ASA/Arvum Group travel bursary for BSc (Hons) in Agricultural Science students. The winner of the ASA/Glanbia bursary was second year BSc in Agriculture student at WIT, Ger Boland from Boultheeny, Dolla, Nenagh, Co Tipperary. 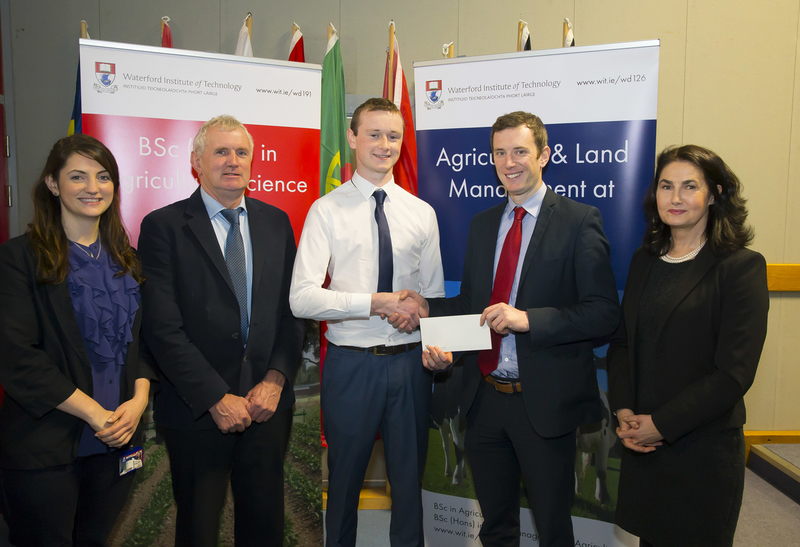 Third year BSc (Hons) Agricultural Science student Martin Duggan from the parish of Galmoy in Co Kilkenny received the ASA/Arvum Group travel bursary. A bursary of €1,000 is available to one student from each of the BSc in Agriculture and BSc (Hons) in Agricultural Science courses. The bursary is intended to assist the students with the associated costs of travelling abroad on placement in the second semester of Year 2 of the BSc in Agriculture and Year 3 of the BSc (Hons) in Agricultural Science. All students within the two courses who intend to travel overseas for their farm placement are eligible to apply for the bursary. Students were interviewed by a representative from each of the sponsor organisations and also John O’Connor from Teagasc Kildalton who is heavily involved in organising New Zealand work placements for all WIT ag and ag science students. Second year BSc in Agriculture student at Waterford Institute of Technology from Boultheeny, Dolla, Nenagh, Co Tipperary is now working in New Zealand. “The bursary will allow me to travel abroad to visit and work on large scale dairy farms that New Zealand is renowned for. I chose to study Agriculture because there is a good balance of science, agriculture and business delivered in WIT and Kildalton,” he said. BSc (Hons) in Agricultural Science student Martin Duggan is now settling into life in New Zealand. He said: “The bursary really helped me in covering the cost of travel as the flights were expensive due to Christmas time. It also gave me security that I would be able to go to New Zealand as it quite expensive to live over here."